The Pediatric Stethoscopic Mic arrives fastened to a soft tracheotomy tube neckband with Velcro tabs to accommodate any neck size and tension preference. An extra neckband is enclosed and additional neckbands can be ordered from us if your facility does not stock suitable neckbands. 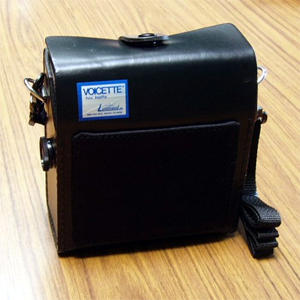 NOTE: The Voicette is designed to turn off the speaker automatically when using the output jack for connection to a recording device. However, this can be modified, if desired, for output through both the speaker and the output jack. There is no charge for this modification AS LONG AS IT IS REQUESTED WHEN PLACING THE VOICETTE ORDER. Rechargeable, built-in battery pack with long lasting charge (usually 2 days to 2 weeks depending on use). Battery pack lasts about 6 years, then is easily replaceable.